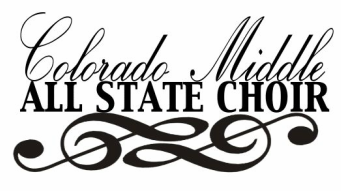 Colorado Middle All State Choir is an organization that serves 7th and 8th grade students in developing choral music audition procedures and performance practices. The “Middle School” designation shall include any seventh and eighth grade student, as well as any ninth grade “Junior High” student. These students are from middle schools around the state of Colorado that their music director is a member of the Colorado Music Educators Association. Colorado Middle All State Choir exists as a “committee” of the Colorado Music Educators Association, whose purpose is to enhance the experience offered in a choral music education program to the highest levels possible. This organization provides an audition opportunity for any 7th and 8th grade students that are in "good standing" and involved in their school choral music program, as well as a two day festival and concert performance for those selected from the audition process. Each year approximately 200 schools around the state register students for auditions totaling approximately 2,000 students. After auditions have taken place in the fall, approximately 500 students are selected from the top scores and teacher recommendations to sing in the Colorado Middle School All State Cambiato, Treblo and Mescalore Choir event. Different well-known Guest Choir Conductors are hired from around the country and abroad to conduct each of the choirs during the festival. The festival concludes with an evening performance at the location of the rehearsal space. Many teachers around the state volunteer numerous hours to process audition results, to select Guest Choir Conductors and organize performance music, to organize hotel and performance facilities, to organize rehearsal and performance schedules for the two day festival. Students and staff are able to learn to prepare for auditions that support the high school experience. In addition, they are given an experience that supports state and national music standards and provides an opportunity to grow aesthetically and emotionally. Section 1: The name of this governing board is “Colorado Middle All State Choir Governing Board”, hereinafter also designated as CMASCGB or the “Board”. Section 3: Colorado Middle All State Choir is an independent non-profit educational committee/business. The purpose of the Colorado Middle All State Choir Governing Board shall be to conduct all affairs and make all decisions associated with the Colorado Middle All State Choir. The Board shall also work to promote and improve the All State Choir experience in Colorado. Board of Directors – The activities and affairs of the Board shall be conducted subject to provisions of these bylaws. All board powers shall be exercised by or under the direction of the executive board. The Board shall be the general policy-making body for Colorado Middle All State Choir and shall be responsible for the budget and all business affairs associated with the Colorado Middle All State Choir performance. Section 1: Membership – The officers of this board shall be the Co-Chairs, Co-Chairs-Elect, Secretary, Treasurer, Immediate Past Co-Chairs, Webmaster, CMEA District Governors, and Judging Liaison. Section 2: The Executive Board shall consist of the Co-Chairs, Co-Chairs-Elect, Treasurer, Secretary, and Immediate Past Chair. They shall have the power to act for the Board in an emergency or between meetings of the Board in accordance with directions established by the Board. All actions of the Executive Board shall be reported to the Board. Section 3: The Co-Chairs shall supervise and facilitate the affairs of the Board and the activities of its members. The Co-Chairs shall preside at all meetings and be a voting member of the CMEA Executive Board. Section 4: All powers, duties, and responsibilities of Board members shall be set forth in job descriptions written by the Board of Directors. Section 5: The Board shall have the power to create and eliminate standing committees as needed to accomplish its duties. The chairs of these shall report regularly to the Board. Membership shall be designated by the Board. Section 7: The Board of Directors shall hold at least four regular meetings per year. The Co-Chairs shall provide at least ten days’ notice to the most recent address on record for all members. The Co-Chairs may call a special meeting at any time upon ten days written notice delivered as above noted. Section 8: A quorum of any meeting of the full Board shall be a majority of its voting members who attend on-site or virtually. Section 1: All persons seeking appointment to the Board shall be active or retired middle/junior high school choral directors, or directors with middle school experience in the state of Colorado. Attend at least 5 board meetings (out of 7 total). October and November are required. Attend at least 5 board meetings (out of 7 total). October and November are required. Exceptions: District 1, 3, and 5 may have two representatives. Section 3: Board members will attend 5 out of the 7 meetings per year; October and November are required, in person, or digitally. Board membership will be reconsidered for members who have not fulfilled these requirements, including those mentioned under section 2. Section 4: Term of office begins at the April meeting following Board approval. Both newly-elected and outgoing members shall attend the April meeting to ensure a smooth transition. Outgoing Governors shall give notice of intent to continue or discontinue as a member of the board by the March meeting. An emergency interim governor may be appointed at the discretion of the Board. All persons seeking appointment will be contacted by the Co-Chairs. Section 5: Choral directors will be notified of vacant positions. Nominees for the Co-Chair position shall be pulled from the current Board. Interested parties should contact a Co-Chair who will then take their nomination to the Board. Co-Chairs will be elected by written ballot the August prior to the beginning of their term. Section 1: The fiscal year for this organization shall be the same as the Colorado Music Educators Association. Section 2: The Board may, by resolution, authorize any officer or agent of the Board to enter into any contract or execute and deliver any instrument in the name of and on behalf of Colorado Middle All State Choir with approval of the Board. Such authority may be general or confined to specific instances. Unless so authorized, no officer, agent, or employee shall have any power or authority to bind the Board by contract or engagement or to pledge its credit or to render its liable monetarily for any purpose or in any amount. Section 3: All checks, orders for payment, and other evidence of indebtedness shall be submitted to the Colorado Middle All State Choir Chair and Treasurer to be co-signed. All deposits will be submitted and accounted for by the Board Treasurer. Section 4: It is understood that Colorado Middle All State Choir funding may come from vocal music students, parents, and/or school funds, and that these funds shall be used solely to enhance Colorado Middle All State Choir student activities unless otherwise approved by the CMSASCGB. Section 5: It is understood that all financial records of the Colorado Middle All State Choir will be available for public viewing upon request. Section 6: It is understood that all tax forms will be submitted yearly as required by the State of Colorado and the Internal Revenue Service. Section 1: These bylaws may be amended and ratified by no less than a two-thirds vote of the Board present at meetings. Notice of such proposed amendments must be made known to members not less than ten days prior to the voting. Section 2: Current bylaws shall be posted on the Colorado Middle All State Choir website.